Hearing of Phife Dawg’s death in March of this year confirmed the legacy of A Tribe Called Quest was sealed. 1998’s J-Dilla produced album The Love Movement would be the fifth & final album of this group who sit at the top of the list of ’Golden Age’ hip hop artists. Then at the end of October something amazing happened, Q-Tip announced there would be a final album released in a couple of weeks time, featuring Phife Dawg! 18 years is a big gap between albums and hip hop sure has changed a lot since then. Tribe have picked up where they left off….and then some. 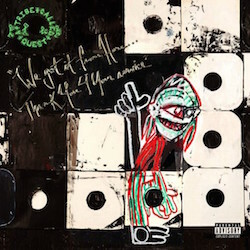 The album obviously wasn’t finished before Phife passed, so those gaps have been filled with special guests including Andre 3000, Kendrick Lamar, Consequence, Busta Rhymes, Elton John, Jack White, Anderson .Paak, Talib Kweli & Kanye West. The trademark use of jazzy samples is still there, but not all the time. Tribe have taken the modern approach of using live instrumentation crashing against the samples, perhaps delving deeper into their jazz roots. This album is dark, political & not full of hits, not what we’re used to with this group, but it shows they’re very comfortable leaving off on this note and their maturity comes across well. This is a 2016 hip hop album in the truest sense, carrying on where To Pimp A Butterfly left off. This will be an important document in the history of this music, and it’s comforting to know the greatest to ever do it still got it. As we head towards the end of 2016, having lost so many inspirational musicians and world events have left people in shock, a new album from Gillian Welch is like a little smile from the universe. Boots No. 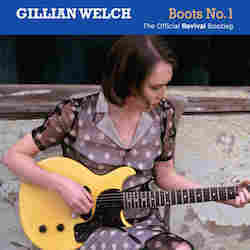 1: The Official Revival Bootleg is being released to celebrate the 20th anniversary of Gillian's extraordinary album Revival, but in these difficult times I think it also serves a far greater purpose, of acting as a medium to bring us together. The double album, curated by Gillian, Dave Rawlings and archivist Glen Chausse, features previously unreleased songs, outtakes, alternate versions and demos, including the first ever recording of 'Orphan Girl.' This is the kind of album that fans crave, and will certainly satisfy anyone who has been touched by the musical genius of Gillian and Dave. The light of this music is needed right now, and they have channeled it into the world through these recordings. An absolute joy to listen to, especially now. Wet Lips/Cable Ties - Split 7"